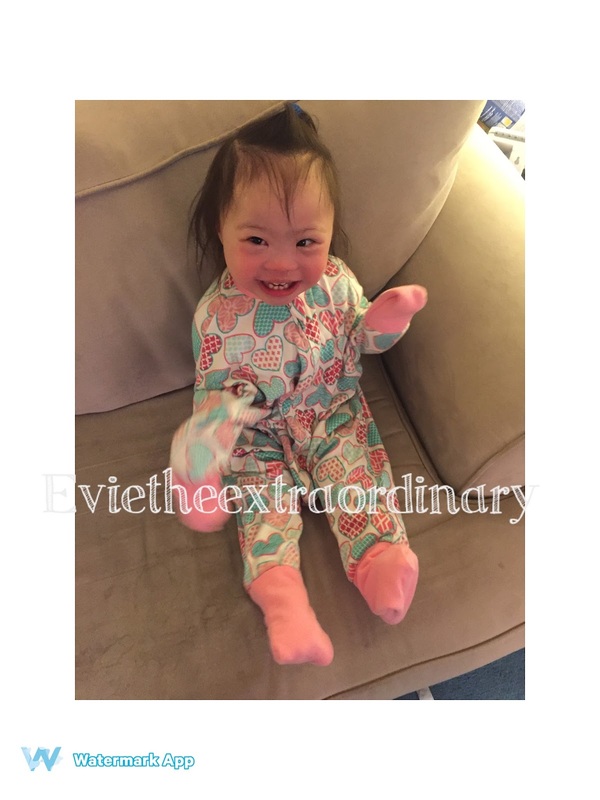 Evie the Extraordinary and Her Mommy: The Journey As We Go: From Starfish to Flying Squirrel, and Evie's Book of the Month! From Starfish to Flying Squirrel, and Evie's Book of the Month! The time has come. Evie is too long to be a starfish anymore. I tried to keep her as one for as long as possible, because as a starfish, she wouldn't be able to grab her g-tube extension tube at night very easily. But as she gets more active and grows taller, it's time to transition to a flying squirrel. If you caught my blog almost 2 years ago about starfish, you will know what I'm talking about. The Zipadee Zip made by sleepingbaby.com has been so life-changing for us, as it kept Evie sleeping longer and also contained her arms so that she wouldn't grab her g-tube as much. 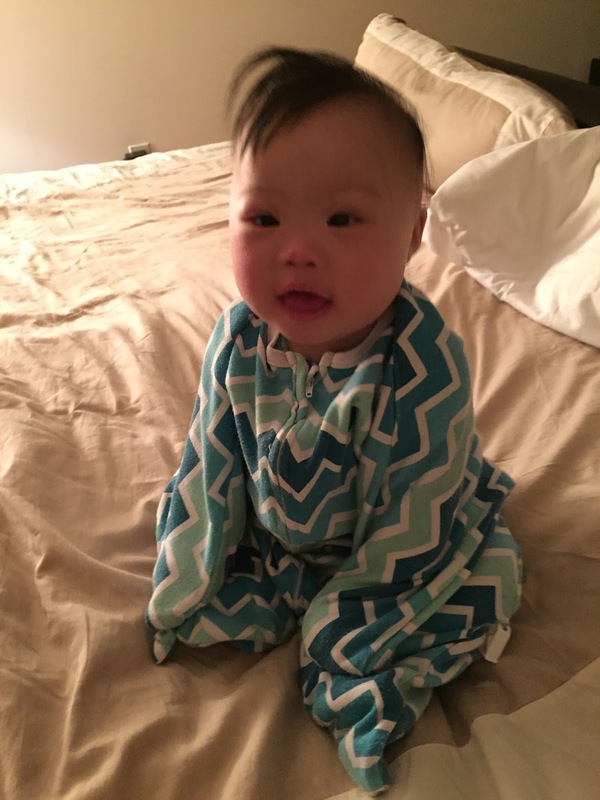 Most kids would transition to just wearing pajamas now, but because Evie is still on her feeding tube (until she decides to eat more), we need something in-between. Enter in the Flying Squirrel, also made by sleepingbaby.com. This sleeping suit allows legs to be legs and arms to be arms, but the cuffs on the hands and the feet allow for either freedom or slight restriction by folding the cuffs back over the hands/feet like mittens and socks. I want to add that the Zipadee Zip comes in bigger sizes, and we could do this, but Evie has taken to pulling her arms in and playing with them inside the Zipadee Zip, so that makes her higher risk for grabbing her g-tube button right out of her stomach if she's bored. The Flying Squirrel allows her to have her arms, but keeps her g-tube nicely covered. Big girl Evie in a Flying Squirrel! Evie ROLLS. She rolls so much when she sleeps. She also kicks me in the face and other sensitive areas while she sleeps, if she happens to be with me in bed. So I'm still trying to figure out if it's better to keep her in a Zipadee Zip or Flying Squirrel. We alternate between the two, and I would say that she "might" roll a little further in a Flying Squirrel because she can use her legs unhindered for more momentum. For a kid who is 2 and not walking yet, it won't make too much of a difference, but once she can walk (please God, let her walk by the end of this year--my back is killing me)....Flying Squirrels all the way! Update on Evie's eyes: She is having less of an eye turn, but I can already tell that she is going to need at least another touchup surgery. We're making progress though! She makes us read this book and "Click Clack Moo" over and over again. I can recite them in my sleep. Thankfully, these authors are actually kind of witty. Oh, what the heck, I'll throw in Evie's Food of the Month, since it has taken me about 3 months to get this blog post up! Siggi's 9% Yogurt. 9 percent!!! This yogurt has extra fattening good stuff in it, as opposed to the usual Siggi's 4% yogurt. A typical breakfast for Evie has been a 100-calorie pouch like Happy Tots' spinach, mango, and kale, + Siggi's yogurt + avocado oil + a scoop of Duocal. She's still doing Pediasure by feeding tube, but we are making gradual progress by reducing her overnight feeds bit by bit. Yay for progress!